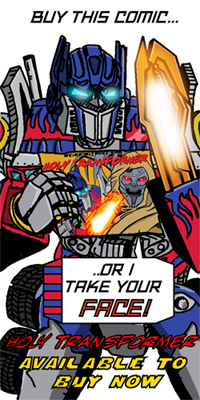 As part of the shadowy cabal of toy sellers known as Toy-Fu, we will once again be at Auto Assembly this year selling vast amounts of Transformers toys to you, but with a difference. All the proceeds from Toy-Fu go to Marys Meals, a great charity that sets up school feeding projects in communities where hunger and poverty prevent children getting an education. A worthwhile cause. In addition to selling toys, we have a raffle where you can win prizes ranging from tat to the fabulous. So kicking off this year I thought I’d share one of the fabulous prizes. 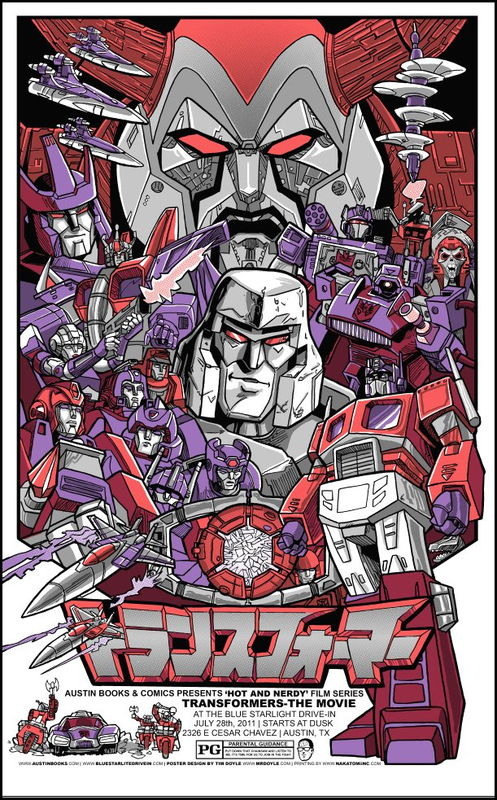 This poster print from Tim Doyle, from the Blue Starlight Drive-In showing of Transformers The Movie in 2011. 16″ by 26’ printed with metallic ink throughout and signed and numbered by the artist. This is No 200 of 225. So if you want to own this and you happen to be at Auto Assembly, stop by and pick up a raffle ticket.